These paleo and vegan chocolate chip cookies are a spin off the old classic recipe, but free of gluten, grains, dairy, and refined sugar! If there’s a dessert I’ve probably made more than anything else, it’s chocolate chip cookies. It’s my go-to treat for get togethers, game nights, etc. They’re not only delicious, but I love that they don’t require refrigeration, cutting, forks, or plates. 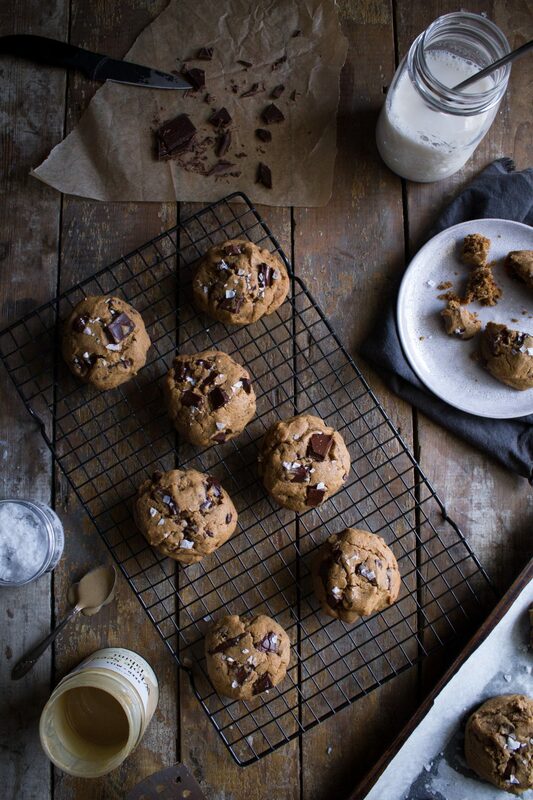 ..and who doesn’t love a chocolate chip cookie anyway?! When I first got married, I’d buy those refrigerated cookies-in-a-log at the grocery store. I got a cookbook for my birthday and the first recipe I picked to make from scratch was a batch homemade chocolate chip cookies. Let me tell you, my life was changed! You just can’t buy homemade taste in a package. If you look through the recipe archives on this blog, you’ll see no shortage of chocolate chip treats. 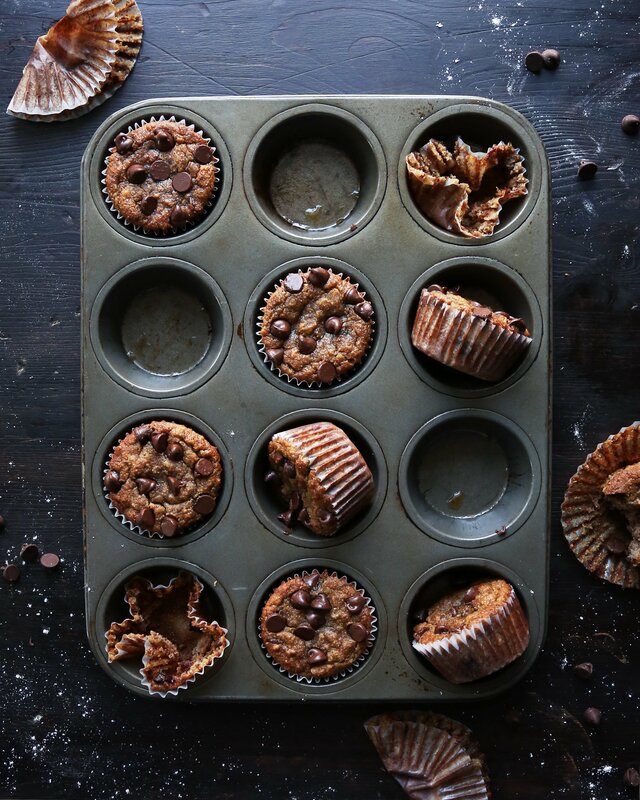 From cookies, to bars, to muffins, there’s plenty of recipe ideas for my fellow chocolate chip lovers! This recipe is so simple and only has a handful of wholesome ingredients. It uses almond flour instead of all-purpose, maple syrup instead of sugar, and coconut oil instead of butter. It has no eggs, dairy, or grains, making it paleo and vegan friendly! Mmm, nothing like eating a hot chocolate chip cookie fresh from the oven, with a tall glass of almond milk! 😋 I hope you get a chance to try this! 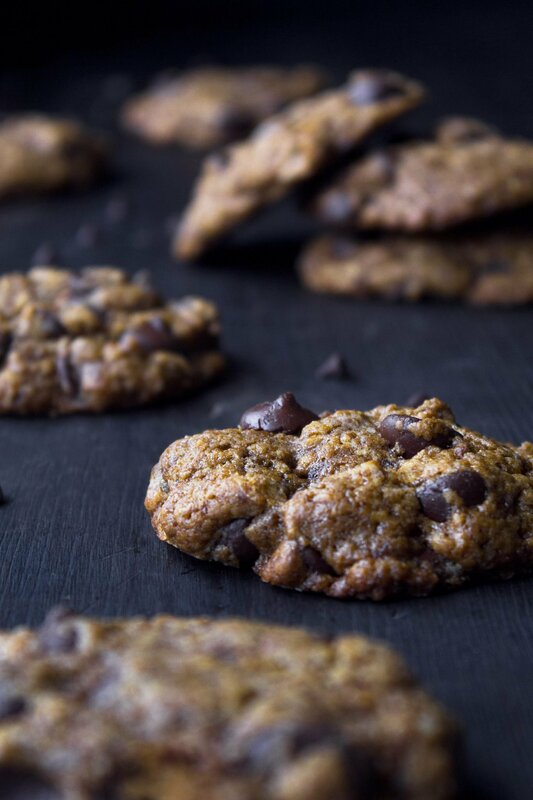 These delicious cookies are a spin off the old classic recipe, using healthier ingredients! These are made with almond flour instead of all-purpose and maple syrup instead of sugar, so they're free of gluten, grains, dairy, and refined sugar too! Preheat oven to 375ºF. Line a pan with parchment paper or a silicone baking mat. Blend together dry ingredients—flour, arrowroot, baking soda, and salt. Add maple syrup, water, coconut oil, and vanilla, mixing just until combined. Stir in chocolate. Roll into large balls, about 2–3 tablespoons of dough. This recipe makes about 6–7 decent sized cookies or 10 smaller cookies. Gently flatten the balls of dough as these don't spread much on their own. Bake for 8–10 minutes, until lightly brown. Don't over bake. Remove and let cool on the pan thoroughly to keep them from falling apart easily. Sprinkle with a bit of flaked sea salt, if desired. These cookies look amazing. Can I use tapioca powder instead of arrowroot? Hi Danielle, I haven’t tried it with tapioca, but I think it will work since they are similar ingredients. Please let me know how they turn out with the substitution if you give it a try. Hope you enjoy them! Absolutely loved it! I used agave syrup instead of maple syrup (I don’t have it) and I didn’t added vanilla extract (it was run out). When I finished the dough I thought that it’s too crumbly and I won’t make the cookie shape so I added one more spoon of agave and 1-2 spoons of water. TIP: When shaping the cookies moisten your hands with water so the dough won’t be so sticky and the process will be easier Thank you, Joscelyn! I’m going to make these cookies today<3 Is it okay to use agave syrup instead of maple syrup??? Hi Cynthia! I don’t provide nutritional values because they’re often times inaccurate, but I ran this through a nutrition calculator and it shows that 1 of 8 servings is 108 calories, 7.2 g total fat, 10.4 g carbs, 7.5 g sugar, 1.3 g protein. Hope that helps! That works, thank you! BTW, love these cookies! These just came out of the oven and they are amazing! I had to pop them back in for an additional 10 minutes because they were still very doughy, but the extra time was just what they needed. Yum!! Thank you Puja! Yay to another chocolate chip fan! These cookies look yummy! I’ll have to save this recipe! These look amazing and so delicious! Definitely saving this recipe to make for my husband and I! Thank you for the compliment! Have a great weekend! These look s delicious and amazing!!!! I can’t wait to make them! Thank you! Please let me know how you like this recipe. Have a lovely weekend! I need this right now! Pinning it! These look great! I make a lot of GF desserts and almond meal is by far one f my favorite bases! Thanks Shelby! I hope you have an awesome weekend! Absolutely mouthwatering! I have never seen a paleo/vegan recipe look soooo good! My husband is paleo and my daughter has a dairy allergy so finding something that fits both their needs always is a blessing! I’m so glad you found something that will work for you and your family, Jess! This made my day! Wow, you really nailed food photography in this post. These are amazing! I’m going to have to try these, they look delish! Hi Emily! Thank you of the kind words. Have a great Friday! These look so delicious.. but can I substitute olive oil for coconout oil, wholewheat flour/oat flour for almond flour? Thank you, Alara! Unfortunately, I don’t think those changes would produce the same results, since almond flour has much more moisture and fat than whole wheat or oat flour. That’s why it only needs a couple of tablespoons of oil compared to most cookie recipes which require 1/2-1 cup. With regular flour it might come out very dry and hard. If wanting to substitute for coconut oil, I’d try melted butter (dairy free would work) since it, like coconut oil, is solid at room temperature. Please let me know if you try it with any changes! Thank you so much, Cori! I appreciate you signing up for the newsletter! I have lots of recipes which use regular flour as well, so I hope you’re able to find some things on the blog you might interested in! First, these look DELICIOUS. Second, I’m so glad you sprinkled them with flaked sea salt. That is my favorite way to enjoy and chocolate chip cookie…so I’m going to have to try this recipe. I like to sprinkle a tiny bit of salt into my hot chocolate, too. It’s SO good. I love salty and sweet hot cocoa too. What a nice combo. Thanks for the encouragement! Definitely going to try making these bad boys! I am always looking for healthier versions of my favorite treats! Saving! Thank you. Have a great evening! Pinning this for later!!! These cookies sound and look amazing!! I appreciate the kind words Sabrina! These look absolutely delicious. I always love a good chocolate chip cookie and with these being gluten free I know I could make them and take them to a get together without the worry of someone not being able to have them. Thanks Ladonna! I hope you have a lovely weekend! These cookies look amazing! My husband is always trying to get me to adapt to his paleo dieting…with this recipe, I will! Your pics are amazing too!